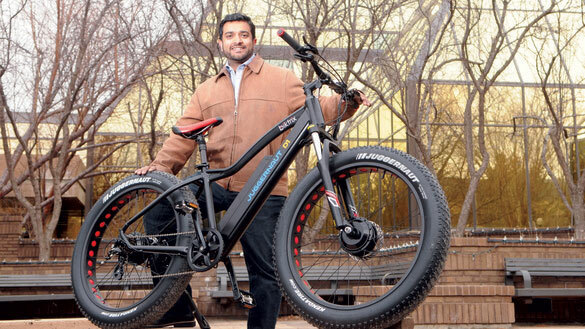 Saskatchewan entrepreneur Roshan Thomas wasn’t looking to create an international export business four years ago when he ﬁrst built a motor for his pedal bike. But that motor inspired the development of a company that is now selling electric pedal bikes around the world. Located in Saskatoon, Saskatchewan, Biktrix sells ﬁve diﬀerent electric bike designs as well as bike conversion kits. “In the past two years, we’ve sold bikes into the U.S., Canada, Iceland, Dubai, Finland, Sweden Switzerland, U.K., Scotland, New Zealand and India,” said Thomas. An emerging star on the international stage, Biktrix had very modest beginnings. Thomas was a 24-year-old computer engineering graduate from the University of Saskatchewan who needed a reliable and aﬀordable vehicle for travel to and from work. He wanted an electric motorcycle, but found them ﬁnancially out of reach; as a result, he began looking into electric pedal bikes. Unable to ﬁnd something in his price range, he built himself a motor and attached it to his pedal bike. It was the beginning. His motor was so eﬀective that he was able to travel at speeds of 32 kilometres per hour, catching the attention of Saskatoon pedestrians. “These are pedal assist bikes—you need to pedal for the motor to work. People used to stop me and ask how I was going so fast. A few people wanted to buy, so I took their bikes and converted them to electric. that’s pretty much how Biktrix got started,” he said. In 2014, he initiated a Kickstarter campaign to raise funds for the development of his ﬁrst electric Fat Bike. The campaign was a major success … and Biktrix was born. Thomas sold more than 50 bikes through the campaign, raising $100,000, which he invested into the company. His goal was to create the ultimate electric bike: a high-quality vehicle that would allow the biker to “ride anywhere” and at an aﬀordable price. Thomas travelled to China to learn more about building electric bikes. this experience helped him both with bike design and production. In the end, he sourced the frame construction out of Taiwan; however, all Biktrix designs are developed and all bikes assembled by his threeperson team in Saskatoon. Initially Biktrix oﬀered two diﬀerent designs: the Juggernaut, a heavy duty, all-terrain “ride anywhere” vehicle; and the Stunner, a sleek electric cruiser that travels more than 60 kilometres on a single charge. In 2014, Biktrix sold just a handful of bikes; in 2015, sales grew to more than 100; in 2016, over 300 were produced and sold, and sales in 2017 are climbing. All sales are done online, cutting out reseller costs and enabling Biktrix to price products below their competitors. “We get e-mails from customers every day who tell us they’ve ridden to places they’ve never ridden before—and they’ve pushed themselves on the bike, because they’re able to get out much more often,” he said. Thomas notes that a company with smaller product runs has a great ability to be nimble and iterate quickly, incorporating customer feedback to create new editions of current models. Biktrix is now on its sixth edition of the Juggernaut and third edition of the Stunner. Unique to Biktrix is the bike’s motor, which is built into the centre of the frame rather than attached on the wheel. This provides more balance to the bike and enables the company to oﬀer bikes in all-wheel drive models. Over the past two years, Biktrix has expanded into other model types, and in 2016 launched a folding e-bike. “We’ve been selling it mostly to people who have RVs, or to commuters. They can fold it up and take it inside with them. It’s a really nimble and versatile bike,” Thomas said. Thomas says 2017 will be a “super” exciting year for Biktrix. The company is launching a line of new models in May, including a conversion kit for wheelchairs. It will also be opening a unique showroom in Saskatoon’s Farmer’s Market site to allow prospective purchasers to test out their line of bikes. Thomas is in the process of securing similar space in markets around the world, to showcase the bikes and enable people to experience them before purchasing. Despite the fact that the company has just three years of sales under its belt, Thomas believes the company is on the cusp of rapid and substantial growth. Their goal? “To be THE electric bike company of choice … and to help people of all ages and backgrounds experience the joy of riding,” said Thomas.